Since October, shares of the Kalyani Group’s flagship firm Bharat Forge Ltd have outperformed benchmark indices including the BSE Auto index, by a wide margin. At the current market price of Rs740, the stock trades at a rich 28-times one-year forward estimated earnings, higher than the 10-year mean valuation too. The sudden U-turn in revenue from contraction to growth in the last three quarters and prospects of unabated sales growth is why the Street continues to support the rich valuation that is among the highest in the auto-components sector. Brokerage firms have forecast a strong 35-40% compound annual growth rate in earnings over the next two fiscal years. Certainly, good times are rolling for Bharat Forge. After a long downturn in US truck sales, the rebound in class-8 heavy-duty trucks sales set the positive note in the quarter ended March 2017. Since then, sales in the segment have been northbound. Recent data showed a record 100% growth year-on-year, with 2018 looking promising too. That’s not all. 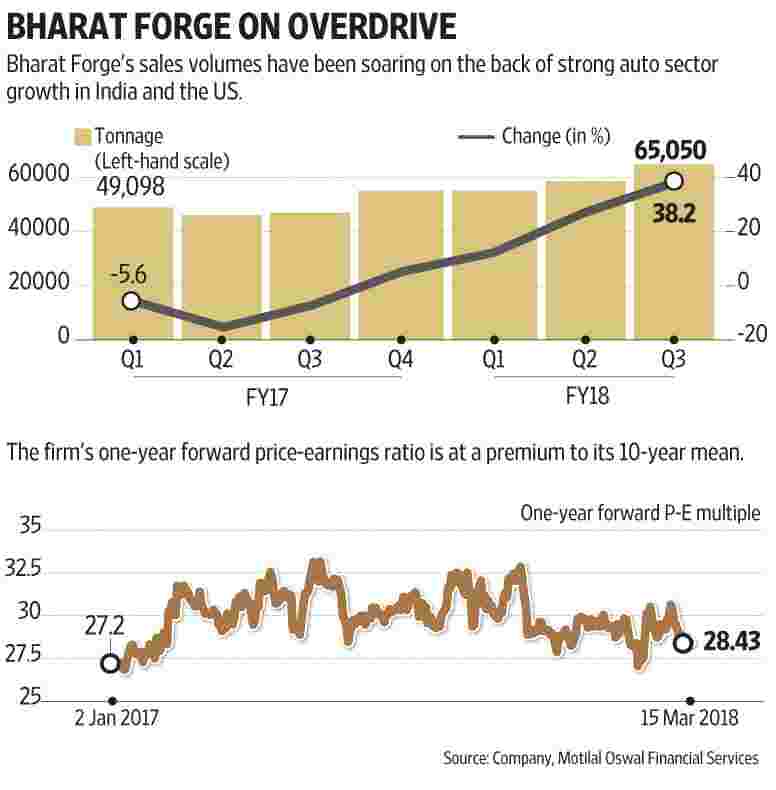 Tailwinds from the growing sales in the domestic commercial and passenger vehicle segments have put Bharat Forge’s domestic business on overdrive. And, its relatively small non-auto-component segment too is garnering higher market share. So, even in sheer volume terms, with all cylinders firing well, the company has been clocking double-digit growth in the last three quarters. This is unlikely to simmer in the near term. Meanwhile, a report by Quant Capital says that Bharat Forge’s initiative on developing components for BS-VI and electric vehicles support investor confidence in the company. Yet, the stock has receded along with the broader market in the last few trading sessions. Clouds of uncertainty due to US President Donald Trump’s decision to restrict imports into the country have raised concerns in markets across the globe, including India. If at all there is an impact, firms such as Bharat Forge that have a significant dependence on US auto markets, are likely to see revenue and profits dented. If not, the company carries with it the risk of high commodity costs, something that has been daunting the entire manufacturing universe. In the near term, the robust upward cycle should help firms such as Bharat Forge pass on cost increases to the customer. Over the last three quarters until December 2017, high operating leverage on the back of rising capacity utilization has been mirrored in its operating margins that have steadily expanded, both on a year-on-year basis and sequentially. So, unless the auto cycle turns down or exports fall prey to macroeconomic policy changes such as trade wars, Bharat Forge is likely to enjoy its premium valuation.